The fallout from Paula Deen’s deposition and the lawsuit itself is a reminder of the ways that race and gender operate within the restaurant industry. It’s bigger than Paula Deen. Yet, as you read media reports, as you listen to various commentaries, you would think this is a story about an older white woman wedded to America’s racist past. Yes, this is a story about Paula Deen, and her crumbing empire. But that is the beginning, not the end. This is bigger than one individual, her reported prejudices, or the lawsuit at hand. 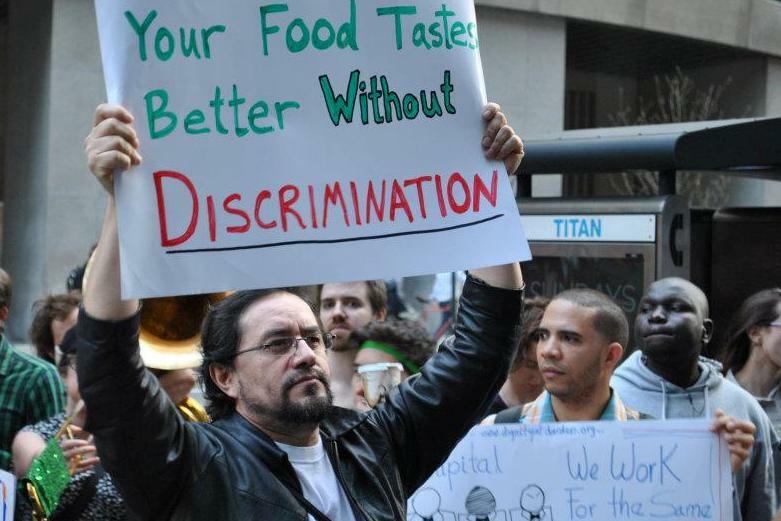 This is about a restaurant industry mired by discrimination and systemic inequalities. Expensive restaurants in New York discriminate based on race when hiring waiters, a new study has concluded. The study was based on experiments in which pairs of applicants with similar résumés were sent to ask about jobs. The pairs were matched for gender and appearance, said Marc Bendick Jr., the economist who conducted the study. The only difference was race, he said. White job applicants were more likely to receive followup interviews at the restaurants, be offered jobs, and given information about jobs, and their work histories were less likely to be investigated in detail, he said Tuesday. He spoke at a news conference releasing the report in a Manhattan restaurant. “There really should not be a lot of difference in how the two of them are treated,” Mr. Bendick said. He was hired by advocacy groups for restaurant workers as part of a larger report called “The Great Service Divide: Occupational Segregation and Equality in the New York City Restaurant Industry.” He has made a career of studying discrimination, ranging from racism in the advertising industry to sexism in firefighting. Mr. Bendick said that in industries, such experiments typically found discrimination 20 to 25 percent of the time. In New York restaurants, it was found 31 percent of the time. A recent report from the ROC (Restaurant Opportunities Center) found that Darden Restaurants (Olive Garden, Red Lobster, Capital Grille, among others) was responsible for creating a racially hostile environment. It additionally concluded that it, “fired black servers because they did not ‘fit the company standard’ at their Capital Grille restaurant” and that it “prevents people of color & immigrants from accessing living wage positions, such as server and bartender, at their Capital Grille fine dining restaurant.” It’s bigger than Deen. According to the lawsuit, dining room workers at Daniel have been denied promotion because they were Latino or Bangladeshi. The employees also say that Mr. Boulud and other managers yelled racial slurs. At one point, they say, Spanish was banned among employees; only English and French were allowed. Those are examples, they say, of how the working culture at Daniel favors white Europeans at the expense of other groups. In March 2008, a national restaurant chain entered a consent decree agreeing to pay $30,000 to resolve an EEOC case charging that the company gave African-American food servers inferior and lesser-paying job assignments by denying them assignments of larger parties with greater resulting tips and income, by denying them better paying assignments to banquets at the restaurant, and by failing on some occasions to give them assignments to any customers. The consent decree enjoins the restaurant from engaging in racial discrimination and requires the chain to post a remedial notice and amend and distribute its anti-discrimination and anti-harassment policies. The amended policies must state that prohibited racial discrimination in “all other employment decisions” includes, but is not limited to, making decisions and providing terms and conditions of employment such as pay, assignments, working conditions, and job duties; also, it must prohibit retaliation. In addition, the company must revise its complaint mechanism and clarify and expand its website and toll-free phone number for the reporting of incidents of employment discrimination. The consent decree also requires the restaurant to provide training in equal employment opportunity laws for all of its employees and to appoint an Equal Employment Office Coordinator, who will be responsible for investigating discrimination complaints. EEOC v. McCormick & Schmick’s Restaurant Corp, No. 06-cv-7806 (S.D.N.Y. March 17, 2008). In January 2008, a bakery café franchise in Florida entered a two-year consent decree that enjoined the company from engaging in racial discrimination or retaliation and required it to pay $101,000 to the claimants. EEOC had alleged that the company segregated the Black employees from non-Black employees and illegally fired a class of Black employees in violation of Title VII. Under the consent decree, the principal of the company must attend an eight-hour training session on equal employment opportunity laws. The decree also mandated that if the company ever re-opens the franchise in question or any other store, it must distribute its anti-discrimination policy to all employees, post a remedial notice, and report any future complaints alleging race-based discrimination.EEOC v. Atlanta Bread Co., International and ARO Enterprise of Miami, Inc., No. 06-cv-61484 (S.D. Fla. January 4, 2008). In September 2006, the Korean owners of a fast food chain in Torrance, California agreed to pay $5,000 to resolve a Title VII lawsuit alleging that a 16-year old biracial girl, who looked like a fair-skinned African American, was refused an application for employment because of her perceived race (Black). According to the EEOC lawsuit, after a day at the beach with her Caucasian friends, the teen was asked if she would request an application on her friend’s behalf since the friend was a little disheveled in appearance. The owner refused to give the teen an application and told her the store was not hiring anymore despite the presence of a “Help Wanted” sign in the window. After consultation among the friends, another White friend entered the store and was immediately given an application on request. EEOC v. Quiznos, No. 2:06-cv-00215-DSFJC (C.D. Cal. settled Sept. 22, 2006). In December 2005, EEOC resolved this Title VII lawsuit alleging that a fast food conglomerate subjected a Black female employee and other non-White restaurant staff members (some of them minors) to a hostile work environment based on race. The racial harassment included a male shift leader’s frequent use of “n**ger” and his exhortations that Whites were a superior race. Although the assistant manager received a letter signed by eight employees complaining about the shift leader’s conduct, the shift leader was exonerated and the Black female employee who complained was fired. The consent decree provided $255,000 in monetary relief: $105,000 to Charging Party and $150,000 for a settlement fund for eligible claimants as determined by EEOC. EEOC v. Carl Karcher Enterprises, Inc., d/b/a Carl’s Jr. Restaurant, No. CV-05-01978 FCD PAW (E.D. Cal. Dec. 13, 2005). The restaurant industry is also rife with sexism – women earn 85 cents on the dollar compared to their male counterparts. Women are also relegated to the lowest-paying jobs with the worst chances of upward mobility. Women are subjected to rampant sexual harassment. Although only 7% of the nations workers can be found in restaurants, in 2011 they accounted for 37% of the sexual harassment complaints to the EEOC. The relative silence about these daily abuses and horrid conditions is telling. It’s bigger than Deen. She is not the lone rotten apple but one of many in a rotten barrel. Yet the emergent narrative that once again imagines racism as the purview of southern whites of a previous generation is revealing. It’s bigger than Deen. It’s bigger than Food Network but about an industry that has gotten away with abuse and discrimination yet we rarely get to see “behind the kitchen door.” This lawsuit, and the media fallout have shined a spotlight on a culture of abuse and exploitation. Yet we cant take our eyes off Deen. This entry was posted in Injustices and the world we live in, Popular Culture and tagged Behind The Kitchen Door, Daniel Boulud, Darden, Discrimination, EEOC, Paula Deen, ROC, Saru Jayaraman. Bookmark the permalink. Listen to ANY rap song and there is more N-words than anything remotely implied by Paula Dean. …which, if true, *supports* Prof Leonard’s post, doesn’t it? Paula Deen is not a rapper.